Erin Moes recorded a career-high three assists against St. Olaf. ST. PETER, Minn. – The Gustavus women’s hockey team used seven different scorers to defeat St. Olaf College Saturday afternoon to earn the series sweep and improve its record to 10-5-2 overall and 6-2-2 in MIAC play. In its highest offensive output this season, five of the Gusties’ seven goals came in the second period and 11 players found their way onto the scoresheet. 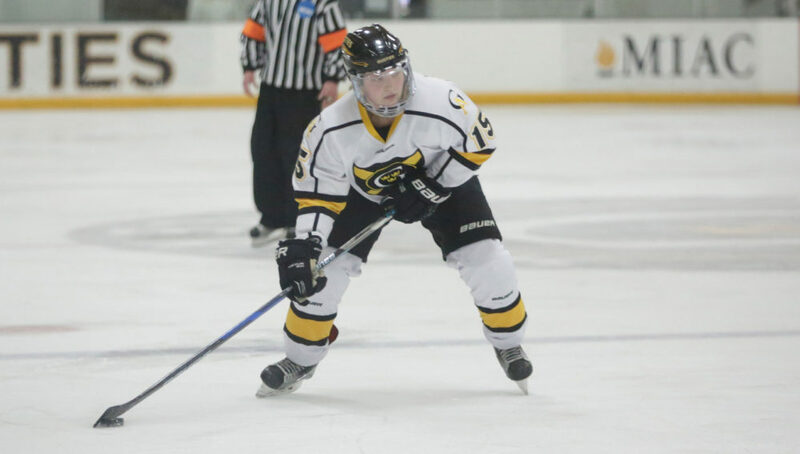 After trading goals in the first period, the Gustavus offense broke open for five goals in the second frame to record the most goals in a period since Gustavus notched six goals in a period in 2013. At the 5:56 minute mark of the second, Kaitlyn Klein (Jr., Plymouth, Minn.) tapped in a rebound goal on the power play to record her team-leading eighth goal of the season. Klein’s power play tally would stand as the eventual game-winner as the home team tallied four more in the second and one in the final frame to post a 7-1 victory over the Oles. The Gusties also saw goal contribution from Allie Lewis (Sr., Kearney, Neb. ), Erica Power (Jr., Lakeville, Minn.), Nicole Abraham (Fy., St. Paul, Minn.), Laine Fischer (So., Northfield, Minn.), Tegan Rodriguez (Fy., Sioux City, Iowa), and Diana Draayer (Jr., Deephaven, Minn.). After recording her first collegiate point a night ago, Rodriguez picked up her first goal in Black and Gold on the power play. Fischer and Draayer also registered their first goals of the year. Erin Moes (So., Hastings, Minn.) picked up a career-high three assists while Abraham also set a career-high two points with a goal and an assist. The Gusties outshout the Oles by a mark of 48-9 and went 3-for-7 on the power play. Bailey Jackson (Fy., Chaska, Minn.) made eight saves to record her fourth win of the season. “Special teams has been a huge emphasis for us. It’s nice to see some rewards on the power play. I actually think it doesn’t show on the stats, but our penalty kill is getting a lot better. Our systems our working good together and it’s fun to watch. We’re at that time of the season where we can talk about how this is what we play for. It’s nice to see that were on an upward swing. It was a good team win and sweep,” Carroll said. Next weekend, Gustavus is set for a series matchup with Concordia College. The Gusties host the Cobbers Friday night at 7 p.m. and Saturday at 2 p.m.